After waking up at around 8:15 this morning, I took a quick shower before getting dressed. My roommates are my fellow students Christian, Andrew and Nathan. We left a little before 9 a.m. by coach for our organized tour of Paris. We first toured the city and the central area around the Louvre before starting our tour of the Cathedral du Notre Dame. The cathedral is located on the eastern half of the Île de la Cité. Founded in 1163, it was one of the first first buildings in the world to use the flying buttress exterior supports. They were necessary to support the narrow nave walls. Another impressive external feature is the multitude of small statues on the exterior that serve as column supports and water spouts. The most popular of the statues are the gargoyles, designed for water run-off. Inside the Nave, we were blown away by its beauty. We saw several relics including a piece of Christ’s cross and a nail from the crucifixion. But most amazing was the Holy Crown of Thorns. The crown is a circle of canes bundled together and held by gold threads. After touring Notre Dame, I just wasn’t feeling too well today. I felt even sicker and walking in the rain certainly wasn’t helping. Christian, Andrew, Doug and I went to the Musee d’Orsay to see the French contemporary art and sculpture, which most notably included French Impressionism. While we waited in line to get in, we had French baguettes for lunch, which Kathy bought while we waited in line. The reason we decided to visit the Musee d’Orsay was because we felt like it was more manageable to see with limited time than the Louvre. We felt the Louvre would warrant an extended visit in the future. The museum is located in old Gare d’Orsay, beaux-Arts train station. Most of the collection is French art dating from 1848 to WWI that includes paintings, sculptures, furniture and photography. It is the large collection of impressionist and post-impressionist masterpieces in the world. We couldn’t believe all of the paintings by Monet, Manet, Degas, Renoir and Van Gogh. Afterwards at about 2:30 p.m., Doug and I left to go back to the hotel on the metro towards our stop, Pigalle. 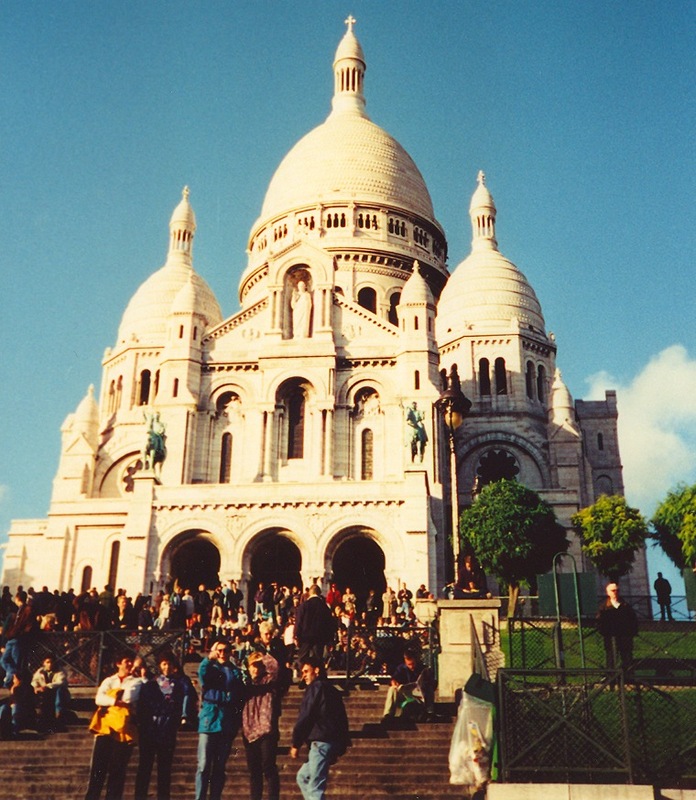 Then after about 10 minutes of dropping off some things we bought, we left for the church of the Sacré-Cœur. We walked down the leafy Boulevard de Rochechouart. Upon reaching the base butte Montmartre, the highest point in the city, we took the funicular up to the Sacré-Cœur on top. The church was finished around WW1 and dedicated to the Sacred Heart of Jesus, an increasingly popular vision of a loving and sympathetic Christ. The church was beautiful inside with many lit mass candles, but the views are unbeatable outside of Paris sprawled out below. After visiting, we left for the nearby Salvador Dali Museum where we toured for an hour. The Espace Dalí, located at the Place du Tertre in Montmartre, has around 300 of his original artworks and sculptures. It is a small museum and not huge on the tourist track, but a must visit if you enjoy Salvador Dali and surrealismo art. At 6 p.m. Doug and I walked to the hotel where we hung out until we agreed to meet Rachel and Andrew later at the Latin Quarter near the famous Collège de Sorbonne, which dates back to 1257. Doug and I walked to the Hard Rock Café, one of the most famous Hard Rocks in the world. It’s tourist and overpriced, but I enjoyed my BBQ bacon cheeseburger, baked beans and fries. Doug and I then walked to the Latin Quarter to meet the others at 10. We were unfortunately 30 minutes late and they had already left us. 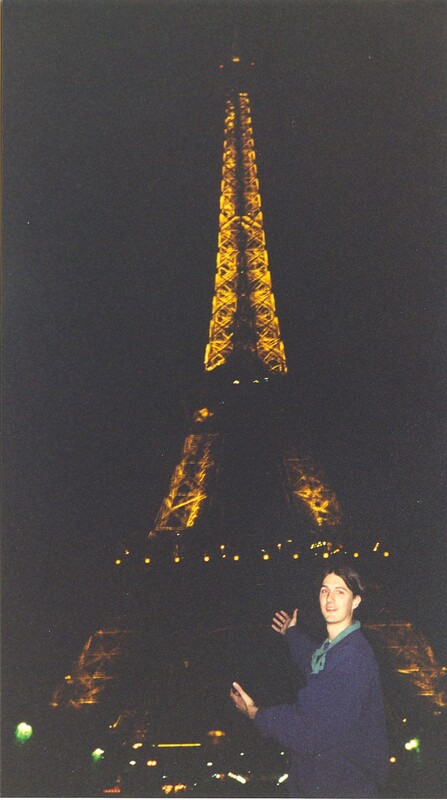 Therefore, we decided to go see the Eiffel Tower. We walked what seemed to be an eternity, maybe an hour, to it. However, it was worth it standing underneath the mammoth structure. There is nothing that prepares you for the beauty of the Eiffel Tower at night. Like the Golden Gate bridge, it was designed to impress. The iron lattice towers above the city at 1,063 feet tall. From 1889 until 1930, it was the tallest structure in the world until overtaken by New York City’s Chrysler Building. It has three levels for visitors, with restaurants on the first and second levels. The third level observatory’s upper platform is 906 feet above the ground. Visitors can take steps to the second level, but the top is only accessible by elevator. Although critics originally complained about its design before the 1889 World’s Fair, it is now the icon for the city and the most-visited monument in the world requiring an entrance ticket. We decided not to go inside but enjoy the views from below. At probably the most inopportune time, I started having problems with my camera. I hoped the only problem was with the batteries and not the camera itself. We then went to a nearby metro stop but it was closed. We walked to the Dupleix metro stop and then rode back to Pigalle where we went to our room. I went to bed feeling worse around 12:45. Despite my cold, it was an unforgettable day in the City of Lights!